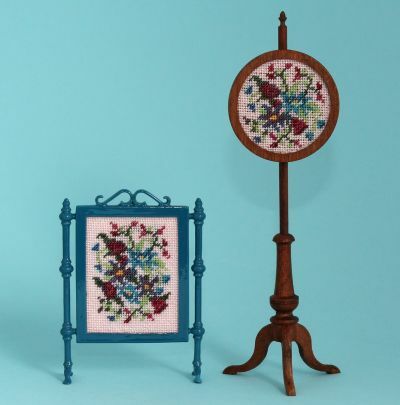 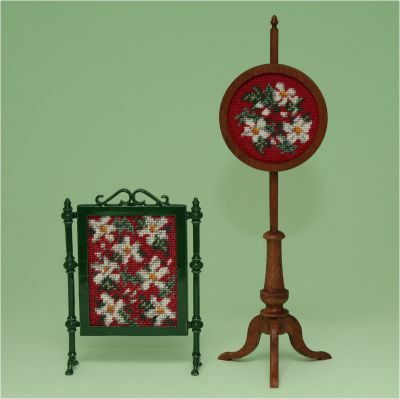 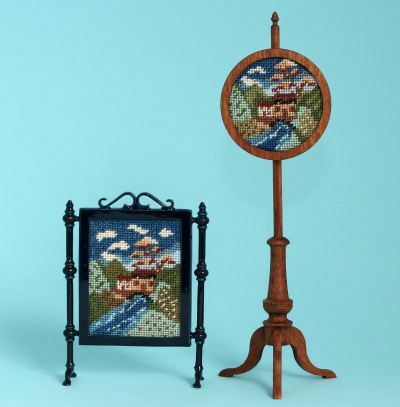 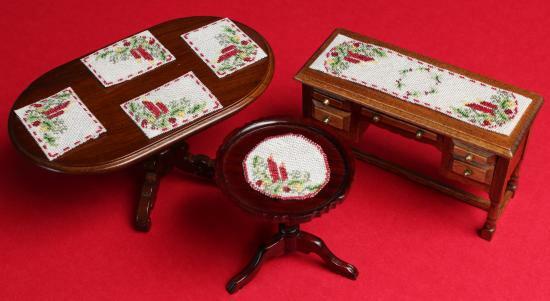 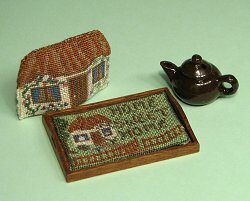 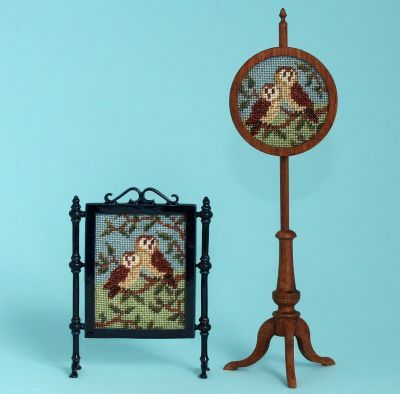 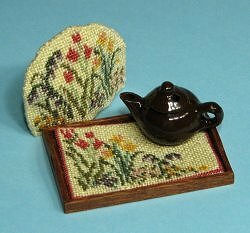 Several different types of doll’s house needlepoint kit are available in co-ordinating designs – in other words, the same design, or pattern, is used for a carpet, cushion, chair seat and so on. 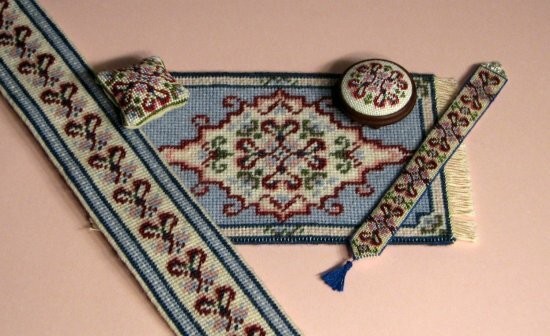 So – if you like the design on a cushion you just made, how about making a matching footstool, or carpet ? 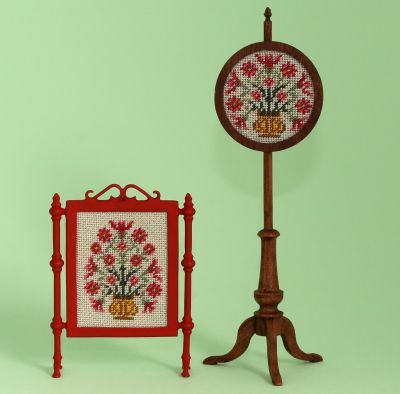 You don’t have to buy a complete set of matching kits all in one go – but you might end up with that, eventually… ! 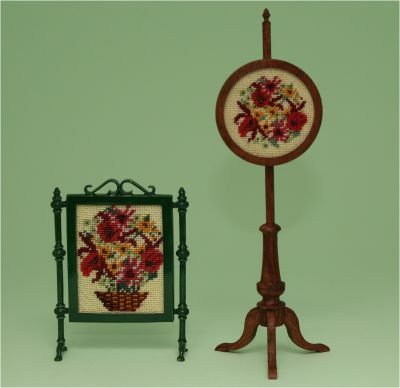 On this page you can see groups of kits which are based on the same design, to help you choose what to buy. 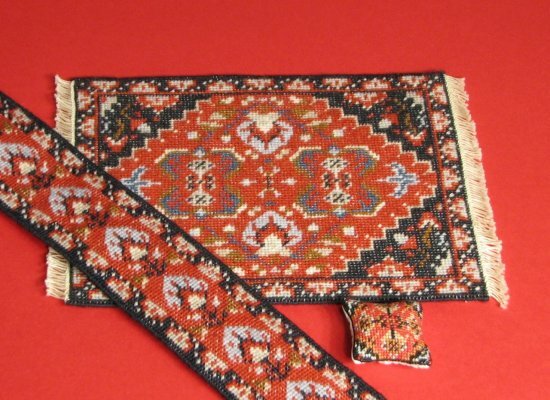 For example, you may see that the motif on a carpet you like is also available on a cushion – so you can then go to the Carpets section and the Cushions section by clicking on the hyperlinks underneath each image, to buy a carpet kit and a cushion kit based on the same design. 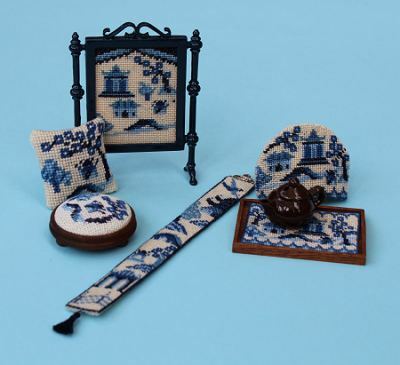 So, for those of you who love to decorate your mini-home with co-ordinating items, this page should make it much easier to locate the items which go together. 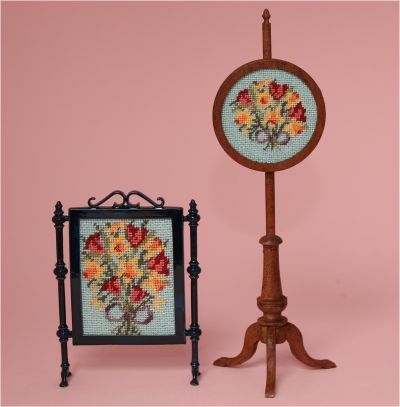 Firescreen kit, pole screen kit. 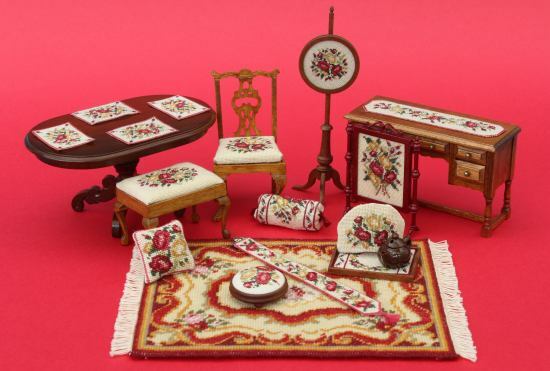 Please note that the CARPET design in this range is called ‘Sarah’, not ‘Summer Roses’ ! 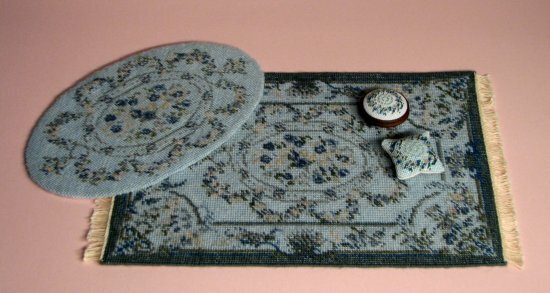 Placemat kit, dining chair kit, pole screen kit, table runner kit, rectangular stool kit, cushion kit, bolster kit, footstool kit, bellpull kit, firescreen kit, traycloth kit, teacosy kit, medium carpet kit. 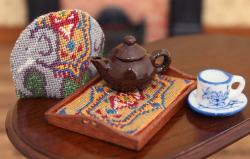 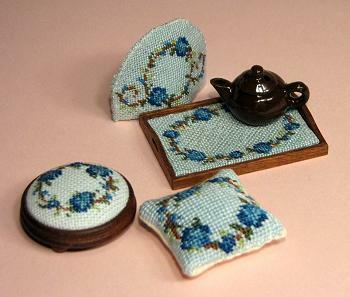 Teacosy kit, traycloth kit, placemat kit, table runner kit. 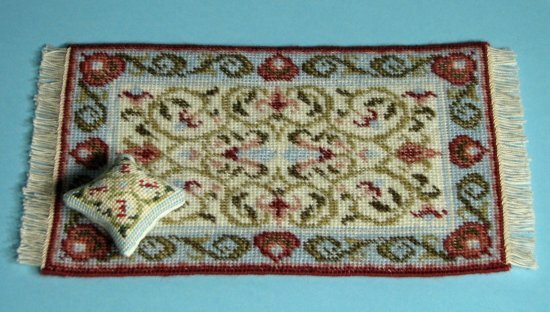 Placemat kit, table runner kit, table centre kit. 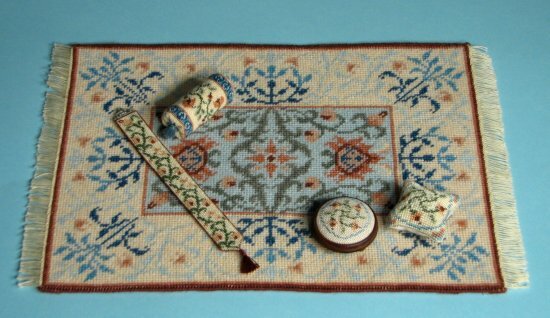 Stair carpet kit, large carpet kit, small carpet kit, dining chair kit, handbag kit, firescreen kit, footstool kit, teacosy kit, traycloth kit, needlework stand kit, cushion kit, rectangular stool kit, bellpull kit, bolster kit. 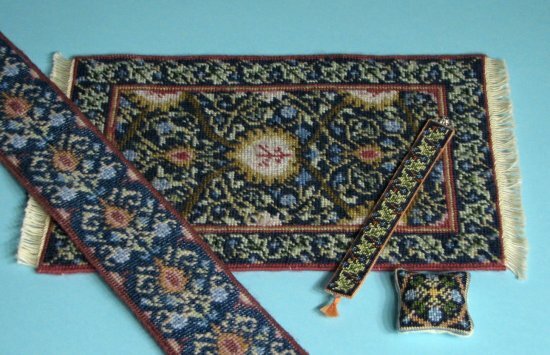 Large carpet kit, small carpet kit. 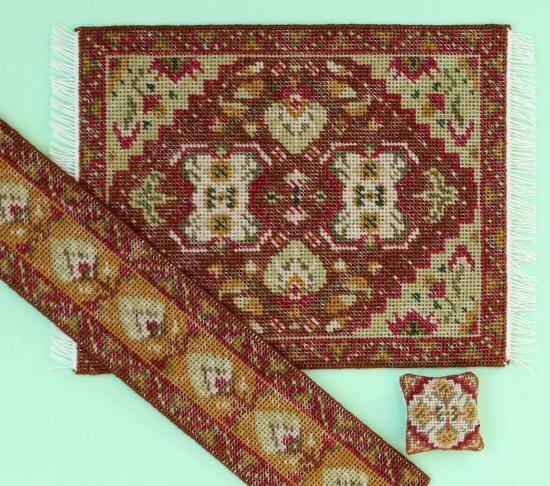 Stair carpet kit, medium carpet kit, cushion kit. 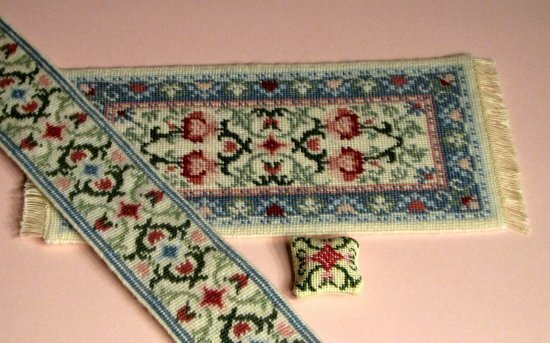 Large carpet kit, small carpet kit, bellpull kit, bolster kit. 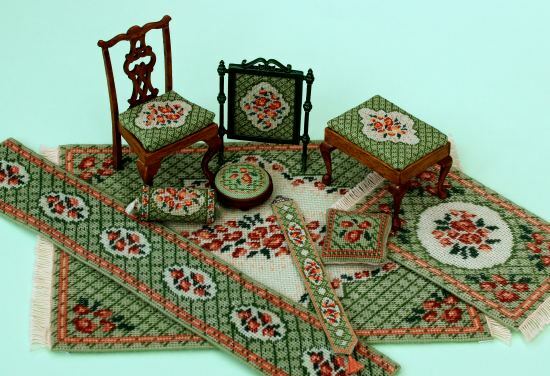 Large carpet kit, stair carpet kit, dining chair kit, bolster kit, bellpull kit, rectangular stool kit, cushion kit, footstool kit, small carpet kit, firescreen kit. 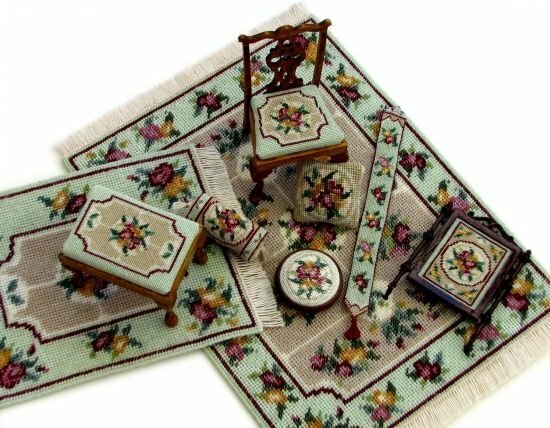 Large carpet kit, small carpet kit, rectangular stool kit, dining chair kit, bolster kit, cushion kit, footstool kit, bellpull kit, firescreen kit. 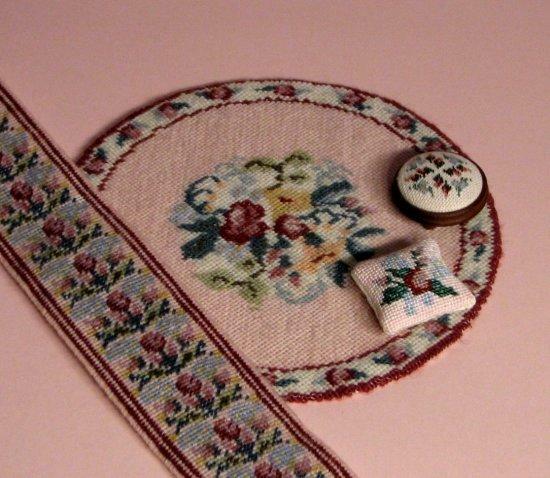 Large carpet kit, bellpull kit, bolster kit, footstool kit, cushion kit. 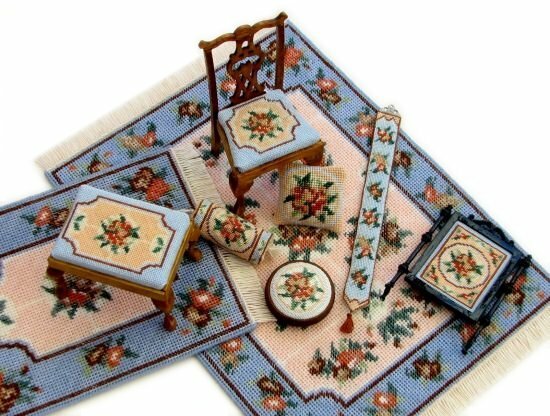 Large carpet kit, rectangular stool kit, firescreen kit, dining chair kit, bolster kit, footstool kit, bellpull kit, and cushion kit (not shown). 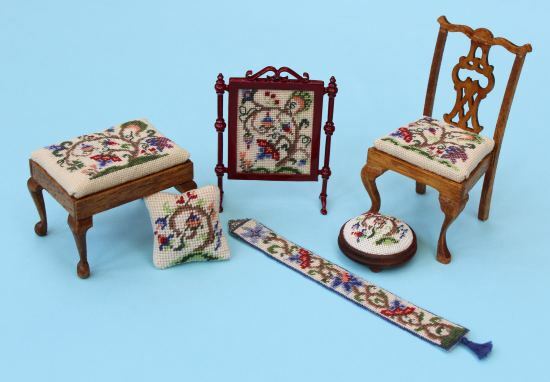 Dining chair kit, rectangular stool kit, cushion kit, footstool kit, bellpull kit, firescreen kit. 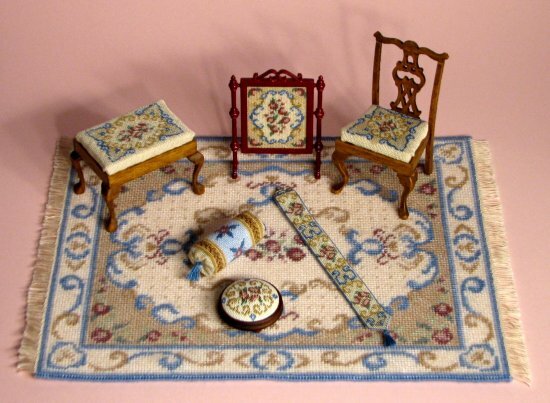 Footstool kit, cushion kit, teacosy kit, traycloth kit, bellpull kit, firescreen kit. 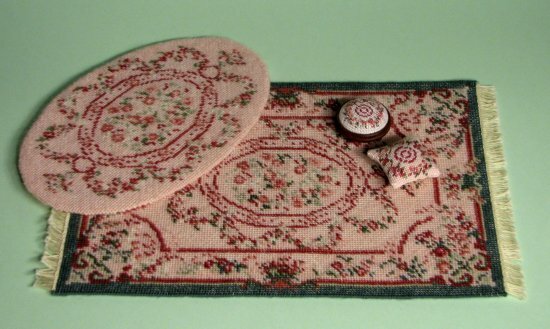 Stair carpet kit, cushion kit, small carpet kit, footstool kit, bellpull kit. 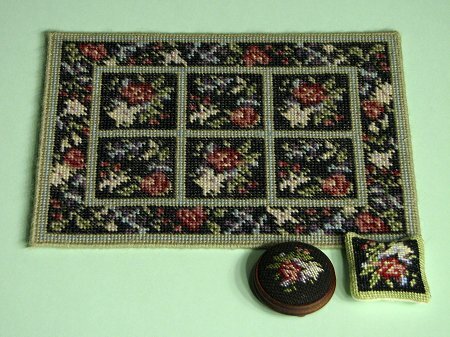 Round carpet kit, stair carpet kit, footstool kit, cushion kit. 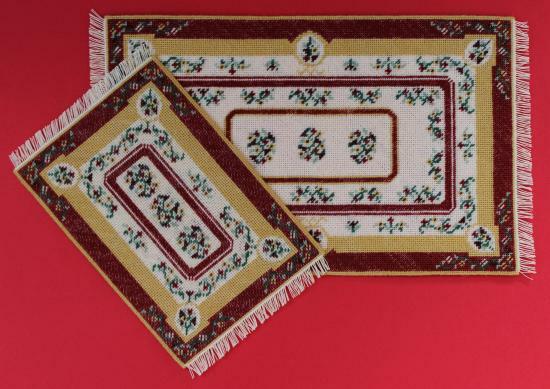 Medium carpet kit, stair carpet kit, cushion kit. 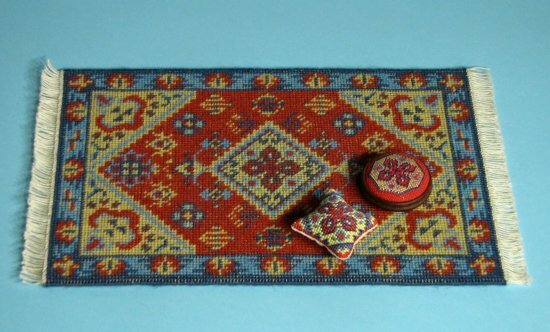 Oval carpet kit, large carpet kit, footstool kit, cushion kit. 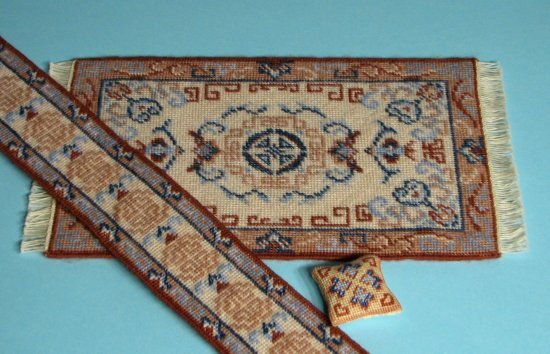 Medium carpet kit, cushion kit. 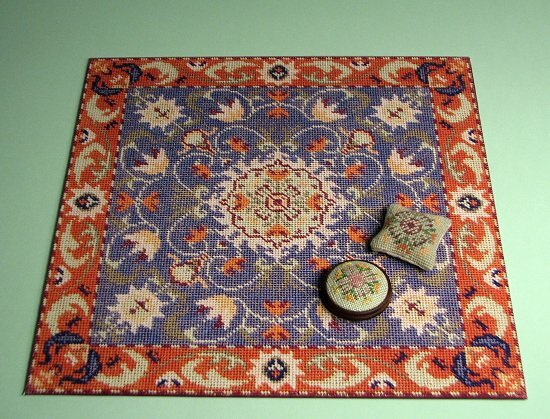 Large carpet kit, oval carpet kit, footstool kit, and cushion kit (not shown). 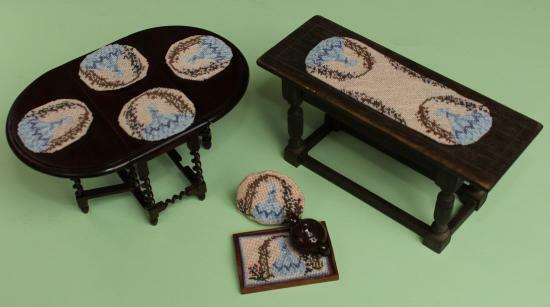 Medium carpet kit, footstool kit, cushion kit. 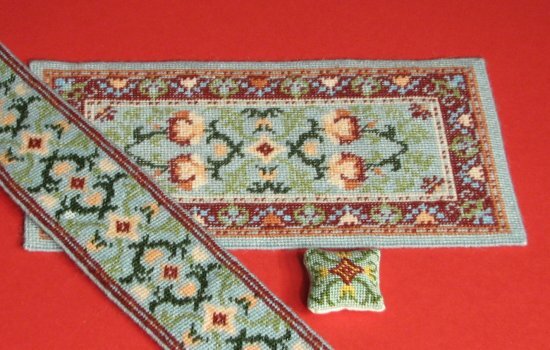 Large carpet kit, stair carpet kit, bellpull kit, cushion kit. 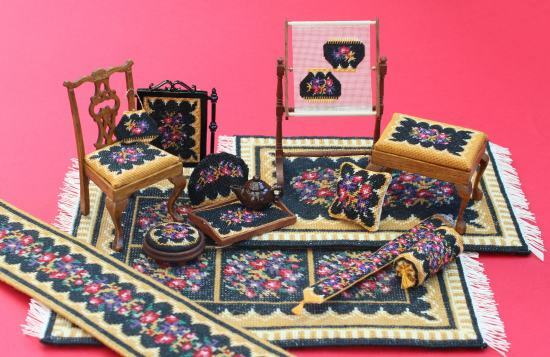 Large carpet kit, footstool kit, cushion kit. 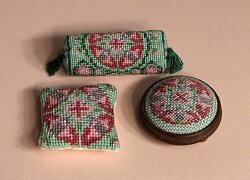 Small carpet kit, cushion kit. 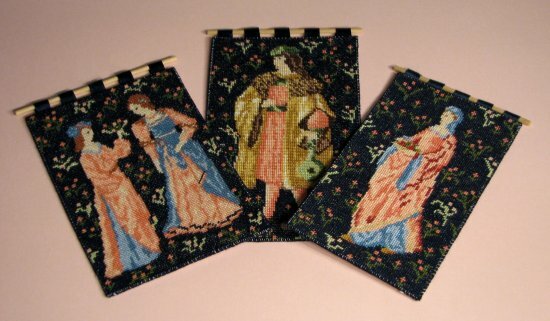 Wallhanging kits: Cluny Women, Cluny Merchant, Cluny Maid. 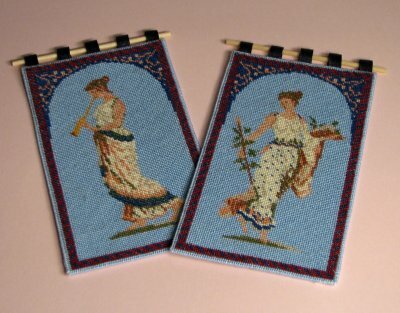 Wallhanging kits: Grecian Musician, Grecian Lady. 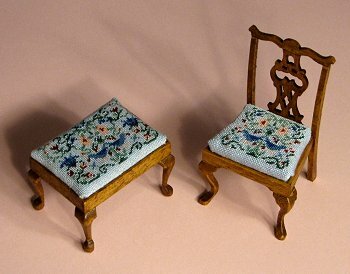 Rectangular stool kit, dining chair kit. 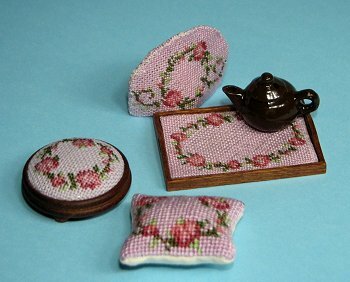 Teacosy kit, traycloth kit, footstool kit, cushion kit. 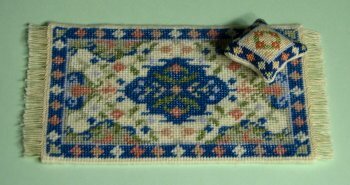 Bolster kit, cushion kit, footstool kit. 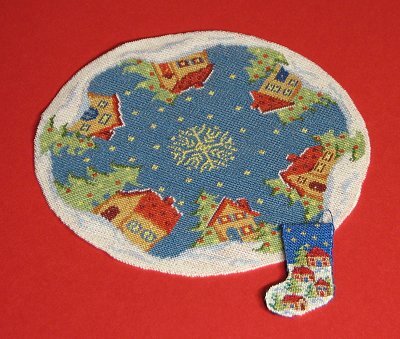 Christmas tree mat kit, Christmas Stocking kit.